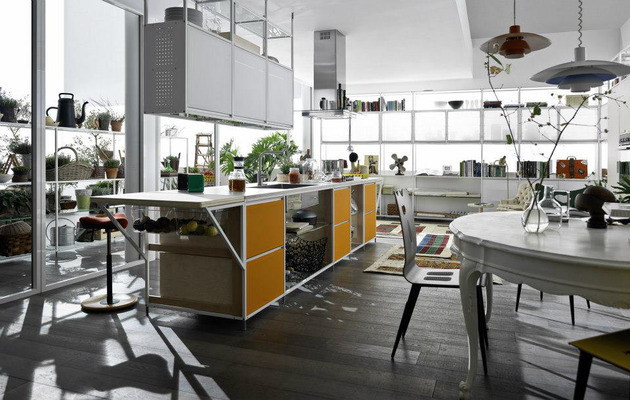 The modern kitchen has become an iconic symbol of fashionable style. It is therefore appropriate that kitchen designers should now keep their eye firmly fixed on the latest textiles and fabrics to grace the runways of Europe especially now that fabric doors can be specified in their next kitchen design! The Meccanica Kitchen by Valcucine evaporates the traditional rigidity of kitchen installation by using an innovative frame work system that can be transported easily, can be assembled by the end user and is 100% recyclable. It even comes with an end of life cycle “take back guarantee” whereby your old kitchen will be collected, sand blasted and re-coated so that it can re-enter the production cycle! Oh yea and did The Mogul mention that the doors are fabric!! The Mogul knows that this is going to be a huge hit with the more Eco conscious inhabitants of the planet as the concept dramatically reduces the carbon footprint of a kitchen. But for those whose carbon footprint does not resemble a Vegan Range Sandal the concept may, in the short term at least, seem to be a step too far! But this innovation must be celebrated as it adds yet another string to the kitchen designer’s bow; combining the flexibility of a break down system with the inexpensive versatility of fabric. The Mogul predicts saturated tones in 2013 with Viridian, Cobalt and Turquoise being used to make bold statements! Aztec and Uzbekistan embroidery motifs will also show well!! Oh go on indulge yourself! This is actually pretty awesome. The first picture weirded me out a bit; I didn't quite know where to look, but I love the fabric use in the kitchen. How practical it'll be in a cleaning sense remains to be seen, but I like the look! Modular kitchens are designed with unique creative ideas by interior designers and decorators. The kitchen cabinet design in the above image is nice and kitchen space is wide enough and decorated neatly. Usually modular kitchen are built with fine stainless steel sinks, racks to place the vessels and other accessories, etc. Apart from this, chimenys and hobs are essential to absorb the excess heat and smoke caused during cooking. Glass cabinet doors helps to access the kitchen accessories such as jars, etc. in most appropriate way. I just saw these same cabinets on another blog and I was totally taken by them! I love their modular design and the company's sustainable attitude toward design. If I'm honest, I still prefer wood cabinets, but these really are a beautiful example of new, modern kitchen styling. Loving the modular kitchen scene of late, it can look really stylish when done right! The fabric doors also look amazing plus add a few accessories and it'll pop! Thanks for sharing such wonderful modern kitchen designs. I have found a new alliance opportunity for Designers/Interior Designer and Architect with a company called water house designs. I love the kitchen design. It looks very modern and professional. It looks like a chef's kitchen. Amazing kitchen design! The open space and very simple but unique storage ideas are great. Thank you all for taking the time to comment - The Mogul will return soon. When we were renovating our home, we had to pay attention to materials used in some of the rooms, especially the kitchen. Also, the storage spaces that we needed require another set of materials. It is important to speak to your designer about it and have an open discussion. I would love to have a white kitchen in my future home. kitchen showrooms Your kitchen is more than simply a place to prepare meals; it is the essence of your home and an investment in your lifestyle. Whether you are looking to create a bold and punchy contrast or an understated look to coordinate with your surroundings, our team at Kitchen Essence ensure that the result reflects the character of the owner and the home. Well that's different. I have never seen a fabric kitchen before. That is really cool and very unique. I wonder who came up the great design of this. Thanks! for sharing good information about kitchen design. some of these designs are amazing. I am all for a nicer kitchen, especially a more modern one. I think some of these kitchens might be larger than my home though. Wow........ amazed with your creative work for kitchen design, this is the first I ever saw..... well done!! A good kitchen remodeling starts with a good kitchen design plan.A kitchen remodel is likely one of the most important renovations to present on your dwelling and by doing so it will also add worth to your home. I really like your blog, the way you create posts and topic you covered are just amazing. I understand how hard it is to get the site visitors interested. I have decided to include your website to my blog list. Nice blog. Excellent kitchen designs. Loved the idea. The information you have shared with us is really so great, nice effort!! Amazing Blog created by you.It is really informative and helpful for me. Beautiful kitchen pics. Thank you for Sharing. Best quality & pretty Miele Appliances in London. Your articles on here really helped me to gain perspective. We have featured similar kitchen Doors products on our website. They are great idea and cutting edge kitchen design. You cannot do part time business with clothes,Kitchen and interior items. In another way you can do that is employ some persons to assit you fully. You can supervise at your own time.